The United States has an official Flag Code with complete instructions on when and how to display your flag? 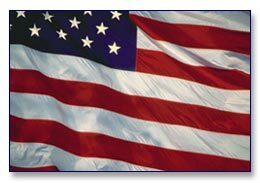 Post 249 stocks 3’ X 5’ United States flags at very reasonable prices. Please contact the Post at (973) 335-9266 for pricing and purchase information. Let's keep Old Glory flying! When is it time to purchase a new flag? Flags that are too tattered, torn or faded for display need to be replaced. Take a few minutes to look at your U.S. flag and compare it to others you see. The U.S. flag on the left is long past the point when it should have been retired and replaced. Please do not allow your flag to fly until it reaches this condition! Post 249 provides a drop off box for U.S. flags which are no longer serviceable. It is located next to the front door of the Post Hall. Flags may be dropped off in the flag drop off box by township residents at any time and they will be included in the next regularly scheduled flag disposal ceremony. When should the United States Flag be displayed? For additional information on U.S. flag display, folding, and other rules and regulations pertaining to our nation's flag, please visit the US History website. The American Legion is proud to distribute the pamphlet, Flag Etiquette shown at left. The pamphlet contains complete information on when and how to fly or utilize the flag, and how to show respect for the flag in public. Please feel free to contact Post 249 for additional details on how you can receive a copy.